Over the years, people have sold and attempted to sell all kinds of unusual things on eBay. In 2005, Andrew Fischer, from Omaha, Nebraska, auctioned his own forehead as advertising space. A company specializing in sleep remedies made the winning bid of $37, 375 and won a temporary tattoo of their SnoreStop logo on Fischer’s forehead for 30 days. In 2008, a pair of Virginia sisters auctioned a cornflake shaped like Illinois. It sold for $1350 to Monty Kerr, owner of TriviaMania.com, who thought it would be a great addition to his collection of Americana. And of course, who could forget the ten-year-old grilled cheese sandwich that sold for $28,000 because it appeared to bear the image of the Virgin Mary. Then there were those notorious auctions that failed to pass eBay’s rules and regulations. In 2004, 18-year-old Bristol University student Rosie Reed attempted to auction her virginity on the site and ended up running the auction herself once the listing was removed by eBay. 10-year-old Zoe Pemberton’s 2009 attempt to sell her “annoying” but “cuddly” grandmother on eBay, though a lighthearted joke, was also taken down by the auction site. 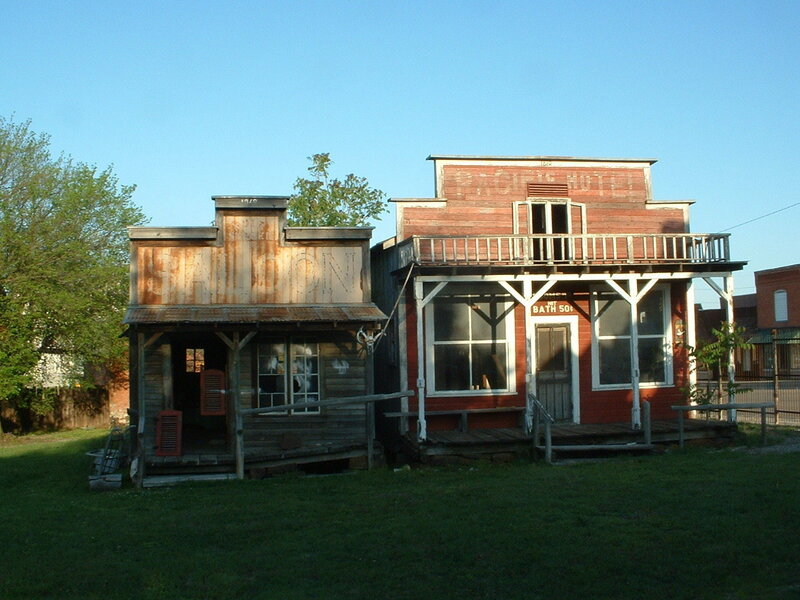 For the auction oddity enthusiasts, consider this week’s eBay listing for a “Wild West Ghost Town” in Clifton, Kansas. The auction title calls out for brave bidders to “own a tourist town on main street.” According to the 2010 Census, Clifton’s population is only 554, though it does hold the honor of being the birthplace of writer and publisher Robert McAlmon. The town of Clifton has a total area of 256 acres and the lot up for auction is 0.75 acres. The bidding for the Ghost Town starts at $25,000 (down from the original $60,000 Century 21 listing) and the auction ends on May 19th; there are no bids yet. A MIXTURE OF REPLICAS & ORIGINAL 1800S BUILDINGS – INCLUDING A 2 STORY WILD WEST HOTEL, A SALOON, DENTISTS OFFICE, LAND OFFICE, NEWSPAPER OFFICE WITH AN ANTIQUE PRINTING PRESS, SHERIFFS OFFICE WITH A BIG OLD SAFE, ETC & A FEW MORE WAITING FOR YOUR INSPIRATION. SOME OF THE WILD WEST BUILDINGS JUST NEED SOME COSMETICS TO GET THEM IN TIP TOP CONDITION AGAIN & SOME OF THEM NEED MORE WORK. THIS PROPERTY IS HUGE AND THERE IS PLENTY OF ROOM FOR EXPANSION – I EVEN HAVE RAILROAD TRACKS INSTALLED ON PART OF THE PROPERTY IN CASE YOU WANT TO ADD A TRAIN CAR OR STATION! THERE ARE ALSO SEVERAL UNIQUE ATTENTION GRABBING EXHIBITS ON THIS PROPERTY WHICH ARE INCLUDED IN THE AUCTION – NAMELY A REAL STUNT PLANE THAT HAS BEEN FLOWN INTO THE ROOF OF A BUILDING & A CAR IN A TREE. IF YOU WANTED TO GET SOME OF THE MONEY BACK ONCE YOU HAVE PURCHASED THE PROPERTY YOU COULD ALWAYS TAKE THE PLANE AND CAR OUT – I KNOW THAT THE PLANE COST THE PREVIOUS OWNER $4500 TO INSTALL & I HAVE HAD OFFERS TO BUY BOTH OF THEM (YES EVEN 2 OFFERS FOR THE CAR IN THE TREE!) BUT I HAVE KEPT THEM IN BECAUSE THIS PROPERTY SITS RIGHT ON HIGHWAY 9 & THEY ARE SO UNIQUE & GET SO MUCH ATTENTION FROM PASSING TRAFFIC . The current owner, John Hayter, decided to list the property on eBay to get more exposure, and according to Vicki Conn, the Century 21 realtor, most of the interest has been local, coming from the City of Clifton itself. Some individuals have been interested in turning the lot into a flea market or using one of the buildings as a photography shop. Conn said that most people were interested in the “commercial aspect” of the property and its potential for new business, not its current state as a “Wild West Ghost Town.” When asked about the listing, Conn laughed, “it isn’t a real ghost town” and recommended speaking with the Clifton City Clerk for more history on the property. Connie Brunell, Clifton City Clerk since 1988, immediately said she was “not a fan” when asked about the property’s current state. Nostalgic for its original charm, Brunell explained that “a local guy bought the old lumber yard and he and his step-father built these buildings… kinda like an old west town. Real cute.” That Clifton local, Daniel Deaver, collected antiques and properly appointed all of the little buildings, like an old dentist’s office with a chair, and an old-timey saloon with a bar. In the little town, Deaver would host “quick-draw gun shows with real cowboys from Abilene,” said Brunell. In 2007, Deaver sold the property to a man whom Brunell described as “a guy from California who worked on movie sets.” The new owner promised 5,000 visitors every weekend to see the tourist attraction and in an attempt to raise interest, he put a Volkswagen bug in a tree, crashed a stunt plane into a roof, and put human-sized prop aliens around the property and in the cars. Brunell was disappointed with the changes, saying it “made a joke out of Clifton.” When asked about the cars and the aliens, Deaver said, “it wasn’t my taste;” he hasn’t been back to the property since he sold it. Apparently, Hayter ultimately acquired the property through a trade. If you are interested in bidding on the property, you’ll be glad to know that Hayter, who goes by johnny-sherbert on eBay, does have a rating of 100% positive feedback, though his selling history mostly includes things like DVDs and books. If you are enticed by unusual properties and ghost towns with aliens aren’t your style, you could also bid on the floating home used by Richard Dean Anderson in the show MacGyver, with an auction ending on May 10. Currently at $99,900 with 91 bids, and a reserve not yet met, it’s a bit more of a financial commitment. But surely some MacGyver fans will jump at the opportunity. Happy Bidding!